What is a Business Model? Why is it important? Explained in a simple and useful way so to better understand the world we live in. The business model tells how a company’s economics works. It is not only useful for companies. We all have an economic model; we earn money by selling our skills and we spend money for our needs. We are small businesses too. Why is it important to know what’s a Business Model? Because it helps us better understand the world we live in. For instance: why do phone companies give us a phone for 1 €?The phone certainly costs more than € 1. The telephone company is selling us a phone at a price below the cost. They lose money. It’s their business model: to lose a bit of money now, and then earn money later, thanks to our phone calls and internet traffic. Here is a brief presentation that explains, in a simple way, what Business Model is. The presentation shows a method for, simply and quickly, sketching out a business model. The sketch fits all in a single sheet of paper! This tool is called: Business Model Canvas. Who uses the Business Model Canvas? The Business Model Canvas and other tools for business model innovation are used by IBM, ABB, Ericsson, 3M, … The Business Model Canvas, and other tools, have been invented and published by Alexander Osterwalder and are spreading through the world. What can we do now that we know what a Business Model is? We can download the template of the Business Model Canvas here. The template is designed to be printed in large format and is perfect for writing and drawing on it. We can use it for describing our business model, our company’s, competition’s, etc.. We can use it to sketch our project’s business model. I recommend you to buy the book by Alexander Osterwalder: Business Model Generation. You can download 70 pages from the book here. 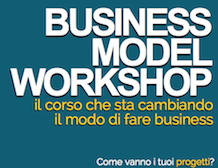 This entry was posted in Business and tagged business model, strategia. Bookmark the permalink.